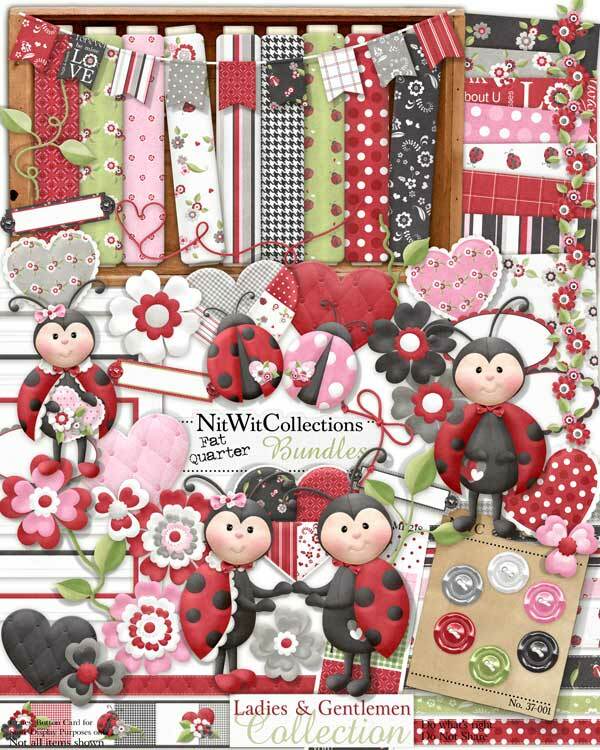 "Ladies & Gentlemen" Collection is cute as a "bug"! (Pun intended, ha,ha) These sweet little bugs have come to life and are ready for your ideas on how to put them to good use. Is it a child's layout or card, it is for a Valentine's day project or anniversary, or perhaps even a picnic or garden theme that you feel they will fit in just perfectly?! Keep them buzzing in your mind, and we're sure they'll land you some great ideas. 6 Buttons to "keep it all together"! 10 Flowers in different styles and colours...what would they land on if there weren't any flowers? 3 Labels - we're not labeling you though! 2 Ladybugs - I think this is where they coined the phrase "cute as a bug"
1 Ladybug in red - maybe this is their sleeping pose? 2 Quilt Hearts - who can resist? ?